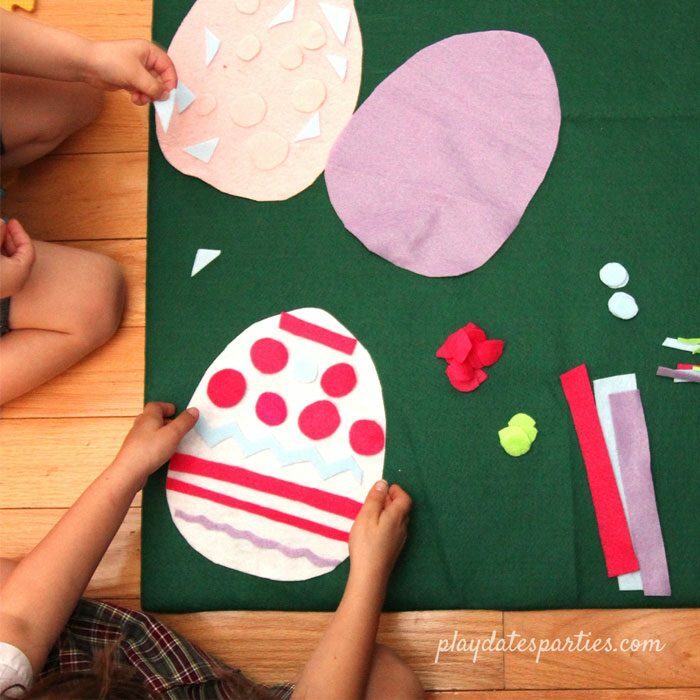 A felt Easter egg busy board is a fun Easter activity for kids of all ages. Easy to make, it’s also a great learning tool for colors, shapes, math, & sorting. Do you remember those adorable felt Christmas trees that were going around Pinterest a few years ago…the ones that are like giant felt boards for the kids to arrange and rearrange the ornaments? I meant to make a version for our own kids one year too, even going so far as purchasing the felt! And then it sat in our storage room for the next two years. Yes, two years! Talk about a crafting fail…it never even got off the ground. But, it seems that was all for the best, because it hit me a few days ago…why not adapt the idea to make an Easter activity for kids? And that’s when I got out the scissors and started cutting. Less than an hour later…we had our very own Felt Easter Egg Busy Board. I kept it simple, with circles, straight lines, zig zag lines and pointed ovals. I could lie to you and say that I planned on having the flower petals and leaf shapes to encourage the kids’ creativity. But the reality is that I tried several times to make cut out pretty flowers for decorations, but failed miserably each and every time. The petal/leaf/pointed oval was my last-ditch attempt at getting something a bit more festive going on. *Think outside the box on this one! We used an unwanted matted picture that was left over from a Goodwill frame. If necessary, iron the wrinkles out of the large piece of felt and cut the cardboard to fit. Wrap the front of the cardboard with the large sheet of felt, using duct tape or hot glue to attach the felt to the back of the board. From the 8×10 sheets of felt, cut three egg shapes. It’s easiest if you fold the felt in half lengthwise and cut out a semi-circle that is larger on one side. Cut circles and small shapes out of the scraps from the sheets used to make the eggs. With the remaining felt sheets, cut strips and zig-zags, trimming to fit various widths of the eggs. 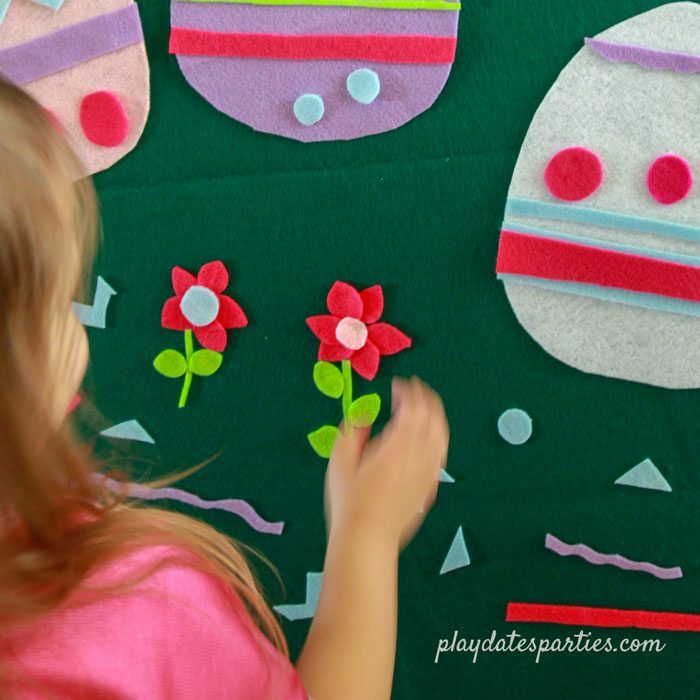 BONUS SHAPES: Use the scrap felt to cut pointed ovals for your kids to make flower petals and leaves. And that’s it! It only took about 45 minutes from start to finish, and that includes stopping several times to help out the littles. When our girls were both home from school, we put the board on the floor and and the girls spent plenty of time sorting the pieces, decorating, negotiating who got which pieces, dumping the eggs off, and doing it all over again! That was definitely a happy mama moment. Now that you see how easy it is to pull together, you can make this fun Easter activity for kids in just a little bit of spare time. It’s a great way to let the kids have even more fun decorating eggs long after the dye is gone. And if you don’t get the craft done in time for Easter…you can always use the felt for the Christmas tree version, too! How would you use leftover felt? What is your favorite Easter activity for kids? Did you like this post? Don’t forget to save it on Pinterest for later! Don’t forget to subscribe via Bloglovin, Facebook, and Twitter to stay up-to-date. 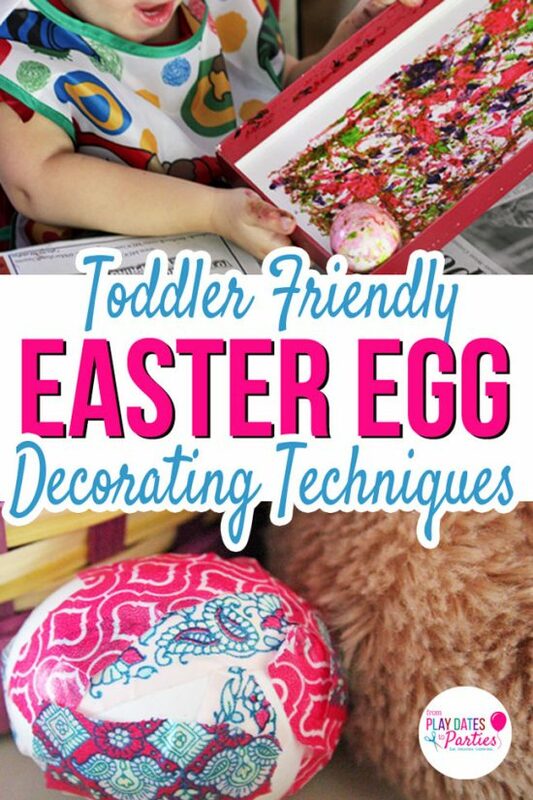 This is a really cute idea to keep kids busy and decorate for Easter at the same time! I love how it gets kids involved with crafting and creating in their own way. I also for some reason have an abundance of felt I’m always trying to find a use for. Sadly, I still have an abundance of felt in my stash. The girls definitely enjoy this activity. And L loved being able to help me choose the shapes and colors that got cut out. Thanks so much for stopping by! This is so cool – and I want to send it to my mom! She has long worked with felt with her art students. Oh, fun! I bet she has some amazing projects she could share. Oh i like this! So cute and way less messier than dyeing them. Which I will do, grudgingly 🙂 Pinned! Thanks for sharing! We will still dye eggs too! This was just a fun little way to get the kids excited about Easter before it was practical to start with real eggs. Such a cute project to keep kids busy! Adding to my Pinterest queue. I really like this idea! I used to help my fellow teachers make some felt boards when i worked in daycare and they were always such a huge hit with the kids. I could totally see making up a whole kit to even put in an Easter basket. Such a wonderful gift that could last for years. Pinned. Very cute, and a smaller version tucked into the church bag would be great for keeping kids entertained and quiet as they listen. What a fun activity for kids! Thanks for sharing with SYC. This is such a great idea, my youngest loves playing with felt shapes but I never thought of making my own. Cute! We’ve made something similar in the past but with paper instead of felt. The kids love these fun projects. Thank you for sharing at The Really crafty Link Party. Pinned. Love this idea. I remember doing lots of felt activities which I was young. Frankly, I was surprised and delighted that kids still play with it. Please stop by Over The Moon party since you are being featured. I used to love busy boards when I was a kid. I had a couple little portable ones. I love this Easter themed board and I like that it’s on a larger scale as well. 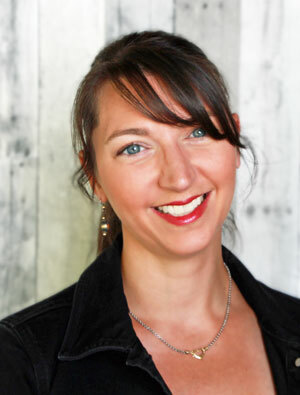 I’m featuring this post at the Hearth and Soul Link Party this week. Thank you for sharing it, and I hope to ‘see’ you there! Have a lovely week! I used to love felt busy boards when I was a kid! I really like this Easter Themed one. I’m featuring this post at the Hearth and Soul Link Party this week. Thank you for sharing it. Hope to ‘see’ you there. Have a lovely week! Felt boards are so versatile! What a great way to entertain kids while getting Easter dinner prepared – thanks for sharing with Party in Your PJs!